A Jack of All Nets' experience in the world of networked systems. A really good client of ours has been colocating with us since late 2003. They’ve grown their web application from running on a Xserve 1.0Ghz DP G4 to an Xserve 2.0Ghz DP G5, then moving their database off to a separate big hardware RAIDed Dell server. They came to us about a year ago (May 2006) and said they were getting a big new client who wanted to run their entire site on their system and they were going to need a load balanced system with plenty of power and scalability. Earlier in the year (Feb 2006), Apple had introduced their second generation MacMini that now sported the new Intel Core Duo chips along with Gigabit Ethernet. At that time, we were also concerned about increased power usage in our cage, so we picked up an Intel Mac Mini 1.66Ghz Core Duo, had it upgraded to 2GB of RAM (the G4’s could only handle 1GB) and started to really put it through it’s paces. It turned out to be a real winner. In terms of power consumption, no matter how hard I tried I could not make that Mini use more than 0.37A of power. I blasted that thing with multiple concurrent CPU and disk bound processes, getting really heavy loads and disk read/writes. In terms of CPU, when we ran a battery of tests to really try and emulate this customers environment which is a very complex PHP web application. It really shone and had tremendous performance, even under load. MacMini Intel 1.66Ghz Core Duo, 2GB RAM and we replaced the stock Seagate 80GB 5400rpm SATA 2.5″ notebook drives with the Hitachi E7K100 60GB 7200rpm SATA drive. These are the drives that IBM puts on it’s blade servers as they are rated for 24/7 usage. host name abstraction to keep the Apache conf files nice and clean. centralized logging of web hits/visits. One of the more interesting experiences we’ve had with this system was when we migrated their Xserve G5 in as web server #4 in the load balanced group. Mind you this is not a puny box. 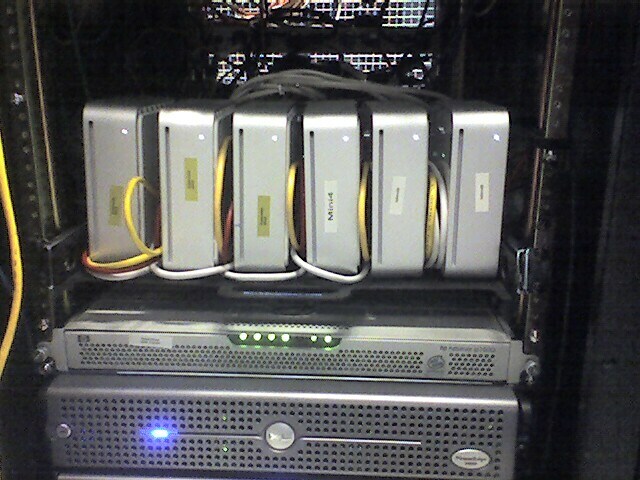 We even upgraded the drive system in it to a hardware RAID 5 based set. Since that time we have had to periodically adjust the weighting rules on the load balancer to give more and more priority to sending hits to the Intel Minis instead of the Xserve G5. We are now at a 3:3:3:1 ratio and the Xserve is finally at a lower overall load average than the minis. Yes, you read that right: the Intel MacMini is somewhere between 2 and 3 times faster than a Xserve G5 in raw cpu performance. We’ve also considered a different configuration whereby we set the Minis on their side and “stack” them horizontally. The Mini is right at 2 inches tall and a 6.5 inch square, so accounting for some space for air flow and cabling you could get 7, maybe 8 of them in a row, resulting in a 4U tall set. With the right mounting, you could get easily 2, maybe 3 of these rows on a sliding tray. You do have to account for the external power supply, but that separation actually works out as a major benefit as the cables could be run so that you have a single U of dedicated space for the power supplies and put some directional cooling air flow over them. The Intel Dual Xeon Xserve looks promising as well in terms of raw cpu performance, but I’ve seen reports that it suffers from the same high power consumption as any other Dual Xeon system does: ~ 3A. However, this is TEN TIMES the power consumption of a MacMini, so for a high density web farm, this is not a better solution. Better to utilize that Intel Xserve as a database server to take advantage of it’s greater RAM capacity (32GB), increased threading (dual dual-core) and 64-bit capability. Related CPU performance anecdote: We have another client with a Compressor video encoding grid made up of Intel MacMinis and he found out (Apple also confirmed it) that he needed to remove the PowerMac G5 DP from that grid as it was the weakest link! In summary, a MacMini based farm is a powerful solution for almost any web application. You get low cost, low power, the ease of use and security of a OS X based system. A very compelling formula. Our client is very happy and is looking to add 2 more MacMinis in the near future. We’ve built this type of system for another client and they are extremely happy with the performance of their web application, too. 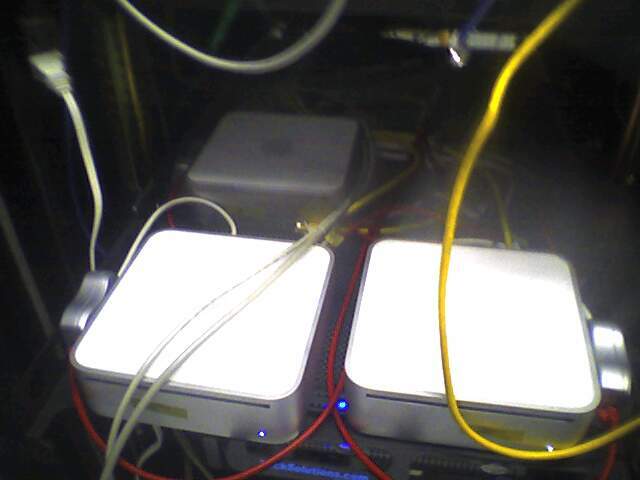 If your organization is interested in a MacMini web farm, please contact us for a quote. I’ve posted a followup to this article. In your performance tests, are these machines all running OS X, Linux, or some mix? You don’t directly address this. Although “security of a OS X based system” implies it, the link to Debian makes me wonder. It wouldn’t surprise me that an Intel distribution on Linux would be faster than anything else because of much better optimization. Also, the minis are Core Duo chips, not Core 2 Duos, they are 32-bit only. It wasn’t until the Core 2 architecture that Intel added 64-bit support back in. – We do have a client that we built out a MySQL database server on a Dell 2850 running Debian Sarge. This system is extremely fast. – I never said the Mini’s were running Core 2 Duos. Perhaps you are just providing background information. We are running a LAMP based web portal from a mac Mini hosted at macminicolo and have been impressed with the performance as well. 1. There have been reports of MySQL having trouble with lots of threads. Something to do with problems with OS X thread scheduler. Apples has a tech note on a tweak to MySQL configuration you can make. We ended up turning off the mysql.allow_persistent with PHP so that persistant connections were not used. That improved performance for us on MacMini. 2. We really miss having visual configuration tools like CPanel. Ended up using Tenon iTools. This has some visual capabilities, but not nearly what cpanel offers. We found the issues with using persistent connections in MySQL as well and turned them off. Please note that this particular architecture we built for this client is not a standalone server as your comment makes your situation sound like. I’m hoping you have proper redundancy/failover/backups for your system. As your situation grows, you will need have some way of scaling out your front-end servers. It also looks like (based on what I read on your site), you will need SSL termination once you reach a certain level of SSL based traffic. Aside from this problem, the minis really rock; so fast but with so little power consumption. We tried running with the system on a fast 3.5″ SATA drive mounted over firewire, but it didn’t really help much, so we went back to internal drives. What sort of cooling problems have you run into with the MacMini setup? Is your datacenter cooled with one large central A/C unit, or is each rack cooled individually? We haven’t experienced any cooling problems whatsoever. The Minis put out so little heat themselves. Mainly because they use external power supplies. Equinix uses centralized A/C with sector based control and N+1 redundancy. We’re using an old G4 Xserve that’s going to have to be reformated due to some OSX Server software problems (Intermittent reboots). In the meantime we’re going to use a MINI while the production machine is down. Any problems using Tenon iTools? Also any tips/tricks on moving the data over? I’m not a hardware guy at all. But the replacement of the mini drive with the Hitachi drive interests me since my original drive just died after 3 months 24×7. Can anyone tell me if this replacement is an easy job for a local semi-Apple support person to do? Is it a quick operation? Thanks . . . The hard part about doing anything inside a MacMini is getting the case apart. After that, most operations are pretty simple as long as you are very careful. If you are unsure about it, it’s worth taking it to your local Apple Store to have them replace the drive. I’ve found Mini’s perfect for this ‘blade’ type application. I’m devastated to learn at appleinsider.com that they may be discontinued. It may be worth forming a group to lobby Apple for something that fits this niche. jbr at onlywebdata dot com.